All the women in this play are deprived of of the right to make their own choices. Priests and rulers dictate their lives by influence or fiat, and Isabella is forced into choosing between being raped or having her brother killed. Thus, it seems disconcerting in this production when she ponders this horrible dilemma by singing the Cole Porter tune "Don't Fence Me In." Shakespeare in Delaware Park, Shakespeare Hill, Buffalo, N.Y.
Pompey (Ray Boucher) is about to turn a girlfight deadly in the Shakespeare in Delaware Park's production of Measure for Measure. 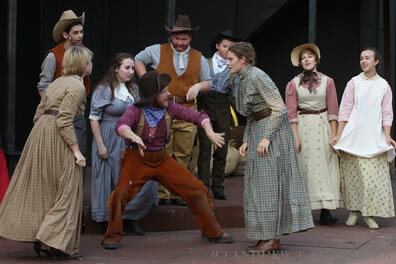 The production sets the play in Vienna, Texas, and turns into a Western musical. Photo by Andrew Schneider, Shakespeare in Delaware Park. According to its formula, Measure for Measure is a comedy. Nobody dies, it ends in marriage—three marriages, actually (as does Twelfth Night)—and it has three prototypical clowns: Elbow (a descendent of Dogberry and Bottom), Pompey (Feste and Touchstone-like in his word-turning wit), and Lucio (kin to Benedick). However, unlike his other comedies, though they all have a dark undertow, William Shakespeare gives Measure for Measure a pervasive bitterness. The three marriages are strained, unwanted, or uncertain. The lead character is the most enigmatic comic hero in the canon, and Isabella's course through the play is tragic to the near end and concludes with her mysterious silence greeting the Duke's marriage proposal. Shakespeare clearly does not take her dilemma lightly. The play's range of emotions, Angelo's psychological crisis, Isabella's moral dilemma, and that enigmatic portrayal of the Duke—though its puzzling aspects may be due less to Shakespeare's purposes and more to shortcomings in the creation—is what endears Measure for Measure to many Shakesgeeks, myself included. Achieving this sweet and sour balance is the challenge of any production of this play, especially as it's easy to make it all sour, unfunny, and overly moralistic. Director Brian Cavanagh, however, has chosen to make the play all sweet with his Shakespeare in Delaware Park production in Buffalo, N.Y. He transfers the play from Tudor-era Vienna, Austria, to the Wild West-era Vienna, Texas, with gunslingers, saloon girls, and singing cowboys. The play is presented as a musical using established Western tunes. The Duke—actually, The Sheriff in this production (Matt Witten)—and Friar Thomas (Michael Wachowiak) sing "Tumbling Tumbleweeds" around the campfire. After condemning Claudio to death, Angelo (Patrick Moltane) sings the Dean Martin-Ricky Nelson duet "My Rifle, My Pony and Me." Mariana (Diane Curley) does the 1891-penned "You and I" as she pines for Angelo. The big finale has the whole cast singing "Deep in the Heart of Texas" before sliding into "Happy Trails" as the epilogue. This transfer of place and time certainly holds promise for Measure for Measure, a play Shakespeare wrote around the time of Queen Elizabeth's death when the specter of Puritans coming to power haunted the theaters. Setting this play in the Wild West with its gunslinger social code and black hat/white hat morality provides plenty of opportunity to explore Shakespeare's cautionary tale for societies swinging too radically on the moral pendulum. The Wild West setting also suits Shakespeare's exploration of female sexuality standards. This is a play in which he juxtaposes the prostitute Mistress Overdone (Sheila Connors as a whorehouse madam in this production) with the novice nun Isabella and sets the pregnant-out-of-wedlock Juliet right in the middle (her condition is morally acceptable according to the play's argument, but illegal in the play's plot). Indeed, much of this play's bitterness stems from Shakespeare's portrayal of how powerless women become in morally strict societies. All the women in this play are deprived of the right to make their own choices. Priests and rulers dictate their lives by influence or fiat, and Isabella is forced into choosing between being raped or having her brother killed (actually, Angelo intends to do both, anyway). Thus, it seems disconcerting in this production when Isabella (Susan Drozd) ponders this horrible dilemma by singing the Cole Porter tune "Don't Fence Me In." "Oh, give me land, lots of land under starry skies above; don't fence me in/Let me ride through the wide open country that I love; don't fence me in" seems far removed from the weight of allowing her brother to die so she can keep her chastity. Similarly, Angelo appears on stage to the theme song of "The Good, The Bad, The Ugly." Maybe that's an elaborate pun for the character, but it inspires a three-dimensional portrayal of a four-dimensional role. Meanwhile, because of the Wild West setting, the Sheriff comes off as the coward some critics have argued the Duke to be. The production starts with townspeople pouring out of the saloon to watch two women fight. Pompey (Ray Boucher) separates the women, hands each a pistol, and they shoot each other instead. Immediately after, a traveling salesman is enticed into the whorehouse by Mistress Overdone. One of her cohorts counts down to an inevitable single shot being fired offstage, and as the salesman's body is carried over the stage, the town sign of "Vienna, TX, Pop. 137" is changed to a population of 134. Sheriff Vincentio is watching all of this from the balcony without ever intervening, and then moves into his opening speech in which he expresses his intent to turn the town's governance—and the institution of law and order—over to Angelo so that he can take a sabbatical. The Sheriff comes back disguised as a friar to watch Angelo's effectiveness (and the deputy's subsequent fall from grace), a disguise that has Witten switching from talking like former president George W. Bush when he's the Sheriff to an Irish brogue when he's the priest. Such incongruities, though, are of little consequence unless you are devoted to the play's moral mist. This Measure for Measure aims to be simply an evening of show tune-light entertainment for the mostly young adult crowd taking in some free Shakespeare while lounging on the grass with their picnics and friends. Cavanagh's intention starts with the set he designed, a bi-level stage caricaturing a Hollywood depiction of a frontier town with signs for P. Yorick Mercantile, Macduff's Billiards, Big Ned Titus as the owner-operator of the General Store, J. Falstaff as the proprietor of the Hot Baths for 10 cents ("Clean water extra"), and the Wells Fargo & Company boasting that "All the world's a stage." Dixon Reynolds costumes the players in standard, Hollywood-cliche Western wear. All of the characters speak with Texas drawls (unless they are disguised as Irish monks), and often supplement Shakespeare's verse with cowboy saws, such as "Always drink upstream of a herd," "Never squat with spurs on," "Never slap a man who's chewing tobacco," and the disguised Duke's advising Lucio, "If you find yourself in a hole, the thing to do is stop digging." Most of these witty wisdoms come from Escalus, who Steve Petersen plays as a veteran cowboy drawing on his pipe as he warns Angelo that "A halo can drop a few inches to become a noose." 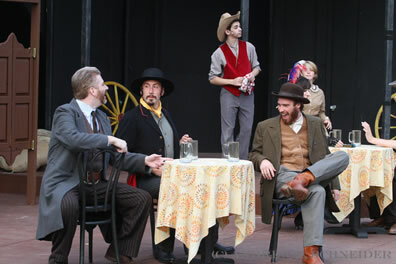 Lucio (Zak Ward, in black at the table) joshes with Gentleman 1 (Todd Fuller) and Gentleman 2 (Geoff Pictor) in the Shakespeare in Delaware Park's Western musical production of Measure for Measure. The bandito-talking gambler proves to be a delightful Lucio. Photo by Andrew Schneider, Shakespeare in Delaware Park. Zak Ward plays the lothario Lucio as a black-suited gambler but talking like a bandito, the combination of accent with Shakespearean wit recalling Zorro. In this manner Ward gets into every corner of Lucio's personality: his easygoing repartee with his fellow gamblers, his true care for his friend Claudio (Brian Zybala), his gentle encouragement of Isabella's suit to Angelo, and his foolish bragging to the disguised Sheriff about his familiarity with the Sheriff and his ways with women. A particularly clever stage business comes at the play's end when the Sheriff orders a proclamation for "any woman wronged by this lewd fellow—as I have heard him swear himself there's one whom he begot with child—let her appear": Every woman on stage except Isabella, Juliet, and Marianna raises a hand. Curley does nice double duty as an Annie Oakley-like Mariana and as Francisca, the prioress of the convent Isabella is entering. Curley turns the simple explanatory line about protocol in the presence of a man—"If you speak, you must not show your face; or, if you show your face, you must not speak"—into a comic uncertainty of the written rule. Then, as Isabella converses with Lucio, Francisca eagerly eavesdrops from above while taking sips from a flask. Another standout is Larry Smith as the Provost, who tackles this heroic part with a solid grasp of Shakespeare's nuanced lines to the point that he seems to have been transplanted to the music-loving Vienna, Texas, from a more conscientious presentation of the play. As for Isabella's silent ending, she sheepishly takes the Sheriff's hand when he proposes marriage. Of course, you wouldn't expect any other ending from a cowboy musical. Though the play's serious side is subsumed in this production, it's nice to see a production play up the genuinely funny aspects of Measure for Measure. It's also nice to see an audience stroll away in a pleasant mood courtesy of Shakespeare and his purveyors.